IMAGE: Luas Cross City could change the city centre more radically than the orignal two lines. LONG READ: COMMENT & ANALYSIS: There’s some very genuine concern for traffic changes in Dublin city centre, but mixed up with that real concern is a campaign of fear and misinformation. The main measures at issue are proposals to ban private traffic from Ellis Quay and from Eden Quay. Some of the people involved in objecting to the sustainable transport measures are playing up and unnecessarily stoking fears towards projects which aim to give priority to walking, cycling, buses and trams. These measures are linked to Luas Cross City, and the Liffey Cycle Route. The simple answer to the above question is that it gets reduced. But, while it’s not really that straight forward, history shows that is what happens. I say it’s not straight forward because more than one thing happens. Some people directly switch from cars to trains, Luas, buses or coaches. Some people keep driving on the diverted route. Some find other routes then some of the people currently driving on the other routes get fed up with the extra congestion from people switching routes and then they switch to walking/cycling/bus etc. Some people take up cycling or walking (yes, there’s tons of people driving within walking and cycling distance in Dublin). Some people drive to park and ride stations or others park up outside the city centre and cycle the rest of the way. The traffic reduction does not always happen overnight but it happens. This isn’t just theory. Traffic reduction is already taking place in Dublin — the number of cars entering the canals at peak times is down from 90,000 in 1997 to 65,000 in 2016. In the same time frame, cars have gone from nearly 50% modal share to 32.1% modal share. This is a success story as the total number of commuters entering the city centre has increased from nearly 180,000 to over 200,000. More and more people are using sustainable transport. The number of trucks on city streets is also radically down since the Port Tunnel was opened. The Ellis Quay reduction is partly due to the Luas construction, but the opening of Luas Cross City and the related tram and bus priority measures planned for later this year will speed the process up and further reduce car use across the city centre, defined as the area within the Grand Canal and the North Circular Road. As per the article published yesterday: Luas Cross City will be transformative for Dublin city — that’s required reading for this article to fully make sense. Last week, under the headline “Warning of inner city traffic chaos if cars banned from quays“, The Irish Times reported: “The north inner city will be blighted by traffic if plans to ban cars from parts of the Liffey quays are implemented, residents and local politicians have warned”. There was very little balance to the claims made in the article, but that follows the media’s reporting of the Liffey Cycle Route (nearly all negative), DublinBikes (it was implied all the bikes would be vandalised, very few were), the College Green bus gate (would kill city centre business it was claimed, it didn’t), the 30km/h speed limit on a limited number of streets (would make it impossible to drive, it didn’t), and Luas (will wreck the city etc, it didn’t). 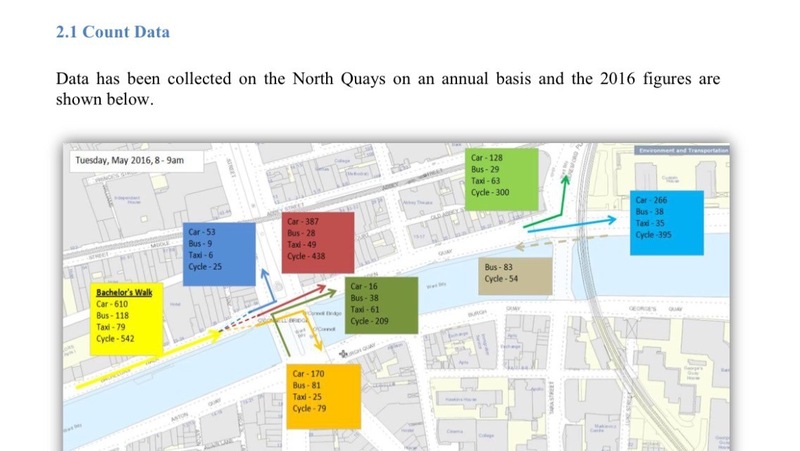 In a similar vain as previous reporting, The Irish Times last week reported on how the traffic would be diverted as if all the traffic would be diverted up singular routes when the council has ad nauseam explained that this is not the case for the proposed Eden Quay diversions related to Luas or the proposed Ellis Quay diversion related to the Liffey Cycle Route. Diversions would be posted as far back as the M50 and again at the north and south circular routes. The newspaper also reported on Mountjoy Square West as if it was a street with light traffic, and not a regional route and part of the inner orbital traffic route. The problem is not just the newspaper — a number of councillors have described streets like North Brunswick Street as being “car park-like” or having “bumper to bumper” congestion. But then — with a straight face — they somehow claim that all of the 374 motorists per hour using Ellis Quay at peak times will fit on North Brunswick Street. That’s physically impossible to fit all of those extra cars — people will change their ways in the ways described above. That’s not fully true — some councillors are using now out-of-date traffic figures for Ellis Quay from before reductions in the last two years. Some of the opponents of the traffic changes are comparing air pollution in London to that of Dublin. London has an on-going issues going between red and yellow alert for months. Dublin isn’t in the same boat — it has air quality issues, but not nearly as bad or as frequent as London, which is in crisis. Looking at the EPA air quality alerts for the last few months, large towns in Ireland seem to have a larger or at least more regular problems than Dublin. But Dublin still needs to act. The EPA has recommended traffic reducing measures and Dublin is continuing to plan such. But Dublin should not sit on its hands in other respects, the World Health Organisation recommends stricter limits and more can be done to restrict traffic. Further improvements are needed to make walking, cycling and public transport more attractive and reduce car traffic across the city. Other measure are needed too — diesel needs to be made less attractive in terms of tax, a city diesel car ban need to be looked at for the future with a date set soon like other cities have done, and, while newer buses are already clearer than old ones, we need to go further and new buses need to run on fully electric, hybrid, CNG or other cleaner engine types. All too often we look at moving cars around rather than moving humans around. Over 65% of commuters traveling into the city centre live under 10km from their place of employment (that means most live within cycling distance). And many of the people commuting further live along Dublin Bus routes or Luas, Dart and Commuter lines. 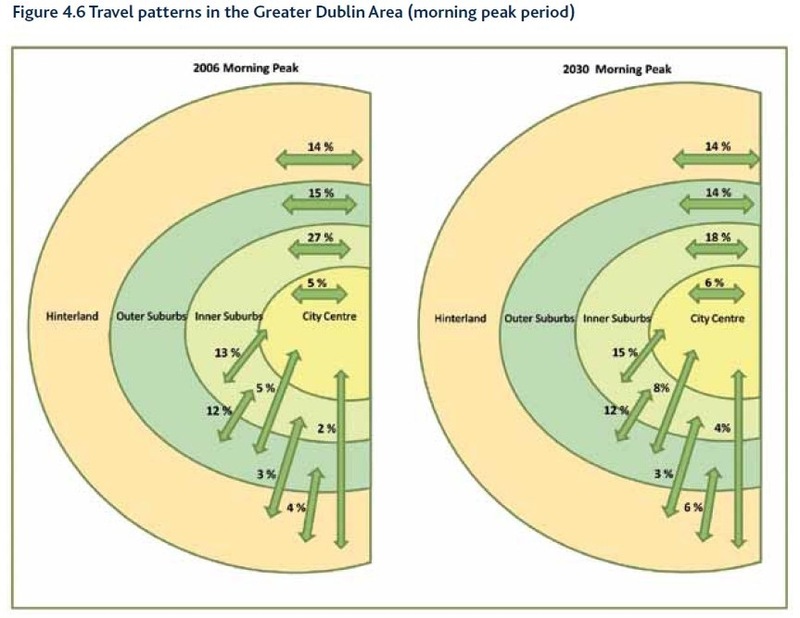 As per the above image, those from the outer Greater Dublin Area are only a small percentage of commuters in the region who commute into the city centre and people who live outside the M50 are more likely to work closer to the M50 than the city centre. The amount of people carried by modes of transport on the quays at O’Connell Bridge and the parallel Luas red line) is shown above — it’s a relatively small number of people. 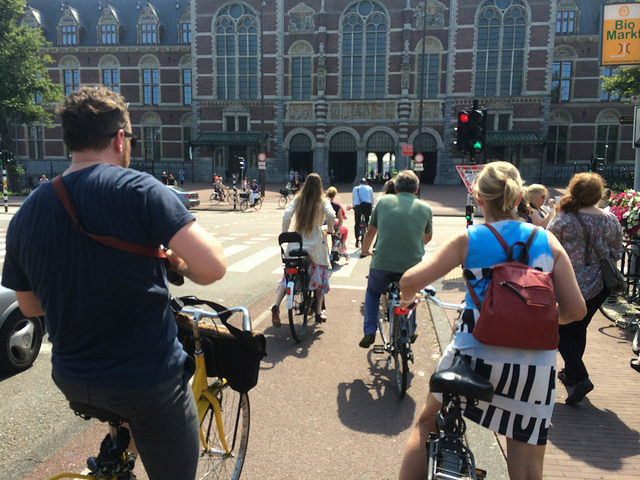 Bicycles are not much lower than cars but the latter takes up a huge amount of space. Despite perceptions of some people, taxis do not (by a long way) outnumber private cars, at least in most directions. But on Eden Quay, bicycles do outnumber cars. 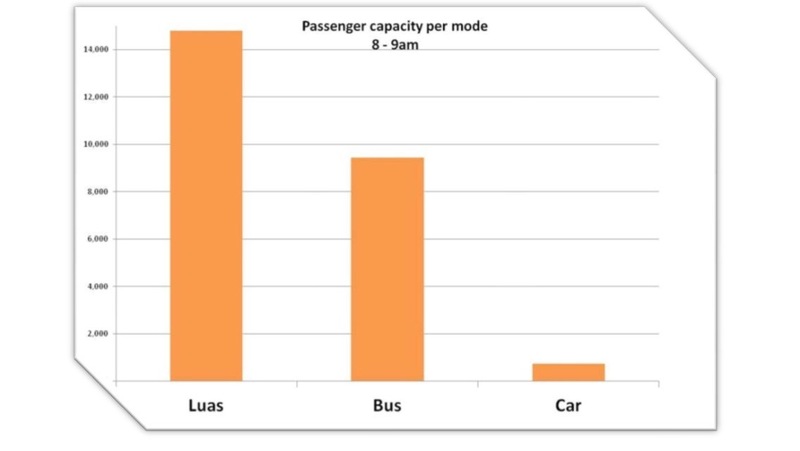 The number of cars per hour is relatively small but they currently take up limited space which is needed to give priority to sustainable transport — if they parked up at the Red Cow, Heuston Station, Navan Road Parkway or further out, just two trams or a few buses or an extra train per hour could carry all the people in cars. But what about those who really need to drive for whatever reason? Access will contuine to be provided to all public car parks and current workplace car parking spaces. The best thing for the people who need to drive is would be that those who don’t really need to drive would switch to other modes for at least for part of their trips. This one is a favourite of those who say motorists would leave their cars if there were other options — the fact is, each year many motorists traveling into the city centre are leaving their cars and public transport capacity is being added to. Luas Cross City will increase the connectivity between the north and south side — linking the red and green lines and providing a high-quality services into areas of the north city which are under served. And it’s not just the Luas green line getting an extension — trams on the green line will also be extended. Luas will also interchange with Maynooth line commuter rail services offering new or better connections than before. Rail services have improved from the west with recently added new services on the Kildare line using the Phoenix Park to bypass Heuston Station and get straight to Connelly and the southside business district stations. If you look at Dublin Bus’s news page on their website you’ll see more buses are being added to across their network — recently capacity improvements included new departures on the 38b, 41x and an extended route 40 bus. Late last year Dublin Bus also added new (minor) bus routes to DCU and capacity upgrades on routes towards Ballymun, Finglas, Lucan, Templeogue, Malahide and Harold’s Cross. More capacity can be added to buses and possibly also rail relatively quickly. Not a huge amount but as a percentage of the total city centre traffic, there’s not a huge amount of people to accommodate. Most observers agree that Dart Underground and the related Dart expansion will be vital to the city and the region (not just the city centre), but the city and city centre can’t wait years or decades for a currently unfunded project which has lost its planning permission because of inaction. In the meanwhile, Luas Cross City, segregated cycle routes, BRT-lite routes, and extra trains (which are ordered or due to be ordered) will have to make better use of the current space on our roads and tracks. We have talked to people who have real concerns about the impact the changes will have on streets such as North Brunswick Street, including the principal of one of the schools on that street. One councillor described the principal and others as being outraged, which does not fit with the letter sent to them or demeanour of the school’s principal — councillors would be better served at this point arranging a meeting between the school and council officials. Even if traffic levels were to drop once the changes bed down, there are already issues on North Brunswick Street which need to be addressed including safe routes to the schools for walking and cycling — this could include new crossings, traffic calming to help enforce the street’s approved 30km/h speed limit, cycle lanes, a formal cycle route up via Smithfield square linking the nearby streets to the school. A vital element needed to keep the area safe and attractive for walking and cycling is that the Grangegorman traffic study (which a draft of is due soon) is focused on promoting a liveable community and sustainable transport and does not design for increased volumes of car use. Enforcing the 30km/h speed limit will also help with air and noise pollution — lowering the amount which cars speeding up and slowing down lowers the pollution because it’s more efficient driving and there’s less engine and tire/rolling noise. Opponents of 30km/h claim otherwise but the key is to limit faster speeds and aggressive acceleration. Rat running must also be avoided and the could should make commitments that they will tackle such if it occurs after any changes. IMAGE: Amsterdam did not always look like Amsterdam, the city made some hard choices to get when it is today. Any amount of extra motorised traffic will be a worry and even a deep concern to city centre residents — even those who suppose sustainable transport — but fears are already being used and stoked by some of the strangest people, including Cllr Nial Ring (who has objected to cycle routes on mental health grounds) and the Irish Parking Association (who a clear conflict of interest). The bigger picture that there will be motor traffic reduction is not being made clear to people. This is likely largely because council officials don’t want to scare retailers who are famous for overestimating the amount of shoppers who travel by car, and they don’t want to spook car park owners (including large retailers and central shopping centre owners) who rely on cars as their businesses. The Eden Quay changes are in the hands of council officials. While the Part 8 process would be more democratic, the act of planning to give priority walking, cycling, trams and buses is supported by a truck load of policy approved by councillors or national governments. What’s the alternative, having the trams at a rate of one every 90 seconds stuck in traffic and stuck blocking all other traffic? Well said Cian ! Why should the majority who are choosing sustainable modes be dictated to by a minority who are not ?! It is somewhat bizarre that people can claim on the one hand that having tons of cars driving in to the city is absolutely essential otherwise the place will become a desolate wasteland and the on the other hand claim that adding more cars to an alternate route is a pestilence. Cars are either the lifeblood of the city or they are not (they’re not). You make a good point somewhat obliquely. The main thing that could be done to help those people who NEED to drive in to the city would be for all those people who don’t to take other means of transport. Why do those complaining about any effort to limit their negative impact on the city never think of that when they are bemoaning the fate of these poor car dependant people when it seems possible that a cycle lane might be built. ‘Here here’ to everything said in the article, as well as the two comments above. Thanks for taking the time to ‘lay it all out’ here. This is the latest in a long line of not just silly but downright hazardous plans by Dublin City and their badly conceived gesture-policies towards cycling and non-car transport in general. What good is couple of meters of interjected cycle lane to anybody when you could be killed getting to it and killed exiting it. Meanwhile the little traffic diversion just forces pollution into residential areas – yes, people live all along that route – there are even schools, as you point out and our EU friends have come out against diesel in their latest volte face lately, so why encourage toxic fumes up around schools? You’ll only cause chronic disease in the children. At least the Liffey river attenuates the gases somewhat. I cycle every day in Dublin and have done so for many years. This is a bad idea. This is a load of rubbish. Keep your diesel fumes to yerself. Have you read the article? How can traffic increase on a street which councillors describe as already near gridlocked? The article makes no sense. You should publish/mod my comment if you want me to engage in a conversation. Which part or parts of the article makes no sense? I’ll happily try to clarify anything. It’s yet another idea with no purpose. It’s not strategic, it’s not integrated, it’s not productive, it won’t bring new cyclists out and I reckon it makes taking the bike more dangerous because the interfaces are still a design disaster – curbs, signs, bollards, lanes, islands, lights, junctions are all lethal. The “plan” moves pollution away from the river and distributes it into densely populated areas – noise, toxic fumes, traffic and fatalities will increase for the people who live there all day and night, not just commuters. Overall, greenhouse gases will increase as more fuel is consumed by vehicles on a slow trail, it increases damage to the environment, and the pollution won’t be attenuated by the river as it is now, somewhat. Most of the day and night the short stretch will be empty but there are several 90degree turns on the proposed diversion route that will just jam the community up from 5.30am until late in the evening – to no end. The community will be made miserable all day long while the quays – a thoroughfare by design since the beginning – lie empty. This arbitrary amazing-appearing-and-disappearing “cycle lane” should be piloted in somebody else’s district – any volunteers for this not-much-road to nowhere? What feedback are these guys getting, what sanity checking are they undertaking for these outside-the-box ideas? Also, with this genius plan, I recommend the planners check that there is no office block planned/built for the proposed route like last time. Again: Which part or parts of the article makes no sense? Whoever or where ever you are getting your information, you are misinformed — the Liffey Cycle Route is planned to be a continuous cycle route from the Phoenix Park to the Point Village. It won’t be a “appearing-and-disappearing” cycle lane. Where are you getting this misinformation from? And it is very much so is strategic. It is a backbone of a planned cycle network. 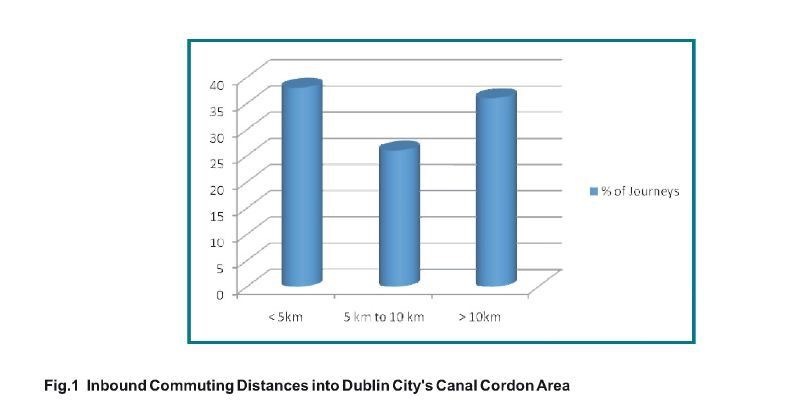 Your claim that it won’t get more people cycling is very strange and has no bases in the past experience: For example the Grand Canal Cycleway has vastly increased the numbers of people cycling. As for pollution: The level of traffic will be reduced with Luas Cross City and the related bus priority measures. But if you really want car reduction in the area you should campaign for the Blanchardstown to UCD bus rapid transport route to be done sooner than later — because that will cut the traffic levels further. Also: Can you please use your real name and not a nickname? First name even would be fine. Thanks! @bertiesballs – This article address the very fears you seem to have. Past experience in multiple cities in multiple countries has shown that traffic won’t increase long-term in the surrounding areas. Traffic falls off due to better infrastructure and public transport. This is exactly what you want isn’t it? This is a city we all have to live in. Let’s try and make it better for everyone. And yes, things can be made better for your area too. They won’t get better in your area with the status-quo of car dominance of public space. That’s detrimental to us all, whenever we are in this city. BTW, I’d happily have a few of these cycle-routes in my area. It has become very obvious that many of the vested interest groups have been extremely rattled by the latest plans by DCC to prioritize sustainable transport in Dublin city centre. Hiding behind their faux concerns for inner city communities and engaging in blatant sensationalism and scaremongering to further own their agenda has become grating. They should be honest and up front with their agenda and allow our communities to properly interpret what is being proposed. For instance, until reading this article, we thought that all traffic would be diverted in or around Brunswick street & Stoneybatter. Not so it seems -diversions will begin as far back as the M50 and at the north and south circular routes. Many people in the inner city welcome a reduction in the number of cars on our city streets, the reduction in speed limits and the impact these measures will have on the ability of our children and old folk to walk safely to school or their destination. We welcome safe, secure, segregated cycling infrastructure and the development of sustainable transport infrastructure because, long term, these are better for communities and very obviously reduce the huge number or cars on the roads, which is what is needed. An excellent article, thanks Cian.